Careful readers will note the omission of "Wednesday in China". On Wednesday, Christina took the camera and headed to Suzhou for an excursion. A link to her pictures will follow. Also, on yesterday's post, it came to my attention that some people were having trouble displaying the picture, which was hosted on a server in China. So I made a local copy. In the afternoon, after the conclusion of the conference, we went on a city tour for which we had signed up. The guide was better than the one we had on Tuesday. Still, I noticed a certain commercial theme to the tour. First we went to the Jade Buddha Temple, which has two buddhas brought to Shanghai from Burma in the late nineteenth century. They are carved out of enormous pieces of rare white jade. We were told a story about how the priest who had transported them from Burma left them in Shanghai because they were too heavy to transport. Not too heavy to move from Burma, but too heavy to move to his final destination in China? That didn't make a lot of sense. After touring the temple, we were taken to the monk's tea room, where we learned about the restorative properties of Chinese tea, and then were given an opportunity to buy some. Next up was a tour of the French Concession. Fortunately, we didn't repeat the tour of the shikumen from Sunday -- probably because one guy had spent too much time in the Jade Buddha Temple gift shop and we were running late. We walked around for a few minutes and then got back in the van. 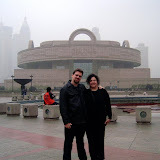 The People's Square also got the walking around for a few minutes treatment, but at least we got a nice picture of ourselves in front of the Shanghai Museum. Our final stop was the "Treasure Gallery". Here was an opportunity to "learn" about pearls and purchase them at higher prices than Amy's.